Rock and Brock may be twins, but they are as different as two twins can be. One day, their grandpa offers them a plan―for ten straight weeks on Saturday he will give them each one dollar. But there is a catch! “Listen now, for here’s the trick, each buck you save, I’ll match it quick. But spend it, there’s no extra dough, so save your cash, and watch it grow.” Rock is excited―there are all sorts of things he can buy for one dollar! So each week he spends his money on something different―an inflatable moose head, green hair goo, white peppermint wax fangs. But while Rock is spending his money, Brock is saving his. And each week when Rock gets just one dollar, Brock’s savings get matched. By the end of summer, Brock has five hundred and twelve dollars, while Rock has none. When Rock sees what his brother has saved, he realizes he has made a mistake. 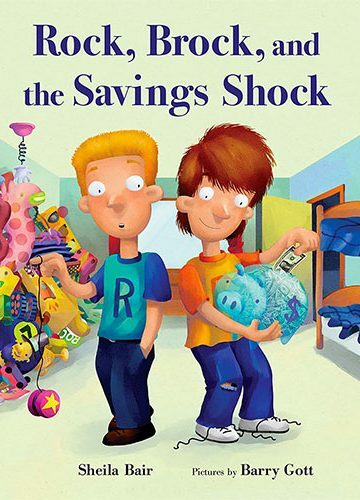 But Brock shows him that it is never too late to start saving. This book is best aimed at children who are at least 2nd-grade level, but it’s great for older kids as well. I love children’s stories about good life habits, and especially the ones about money habits. This story teaches the concept of delayed gratification, money growth, and how you have multiple options on how to use your money.